Sumptuous melody and nonstop swirling stage business characterized Boston Opera Collaborative’s thrifty remix of Puccini’s delightfully inconsequential La Rondine (The Swallow), itself an operetta-style jam-up of Butterfly and Bohème plus something of La Marseillaise, which ended its run yesterday at the Central Square Theater. Stage director Patricia-Maria Weinmann’s not altogether obvious concept of posing much of the production as a dream of central figure Magda, demimondaine avec le cœur, did little to add weight to the conventional frustrated romance; the cuts (from two hours to 90 minutes) proved painless except to the role of Rambaldo, Magda’s wealthy protector—he lost an aria which adds needed complexity—and to the choristers who were not engaged. The black box theater, seating perhaps 150, wrapped the audience close to the action on three sides, the fourth side providing an all-purpose raised stage for balcony scenes and entrances. Weinmann drew a circle on the floor to define the space for action, choreographing almost continuous movement that could be called circling more than blocking. The music never stopped, as the waltz ending Act One morphed into the one beginning Act Two. In the spirit of collaboration, the cast waltzed on and off the stage with various belle-epoch tables and chairs to cue to the changing settings. The thrift-store 1950s costumes proved serviceable if anachronistic to props and story alike. The opening cocktail party finds Susy (Susannah Thornton), Bianca (Rhea D’Alieso), and Yvette (Carley DeFranco) chirping glamorously in well-matched and attractive voices before the first big musical moment comes from two of the principals. “Chi il bel sogno di Doretta” (Doretta’s beautiful dream) begins with Prunier the poet / tenor extolling romance. In the role, Josh L. Rotz brought a brilliant, fresh, seamless lyric sound with intense musical engagement. If his acting had advanced beyond flashing a toothy grin, he might have been as rewarding to watch as he was to hear. In the second verse, Magda, soprano Jessica Jacobs, wistfully recalls love lost. In addition to pipes with real heft and warmth, Jacobs has an expressive face, ever interesting to watch, especially in the Act Three fadeout, where she registered Weltschmerz on a level of the Marschallin in Rosenkavalier. Jennifer Caraluzzi’s turn as the maid Lucette showed her off as the perfect scheming soubrette; I can’t wait to hear her Zerlina. Fran Rogers impersonated Magda’s young suitor Ruggero with some great money notes at the top of his range. The truncated role of Rambaldo adds little musical interest beyond advancing the plot; in it baritone Samuel Brown found little inspiration. Having been disappointed by some of the instrumental ensembles in prior BOC shows, I was not expecting much from the “orchestra.” In the event, Mathieu D’Ordine’s arrangement for piano and string quartet worked surprisingly well. It helped that the company booked a standing foursome, the Glenside Quartet, instead of simply picking up four string players. Quartet members know how to listen to one another, and in this case they also showed exemplary attention to the singers. In the company of the witty and lively conductor-pianist Brendon Shapiro, the ensemble conveyed a satisfying simulacrum of Puccini’s colors and exotic effects. It did not hurt that the arranger (also a cellist) had played Puccini’s bittersweet and elegiac Crisantemi (Chrysanthemums). For a related interview click here. Actually, the mash-up that’s the basis of La Rondine’s plot is of La Traviata and Die Fledermaus. BOC’s cast and instrumental ensemble were indeed impressive, vivid playing in support of well-placed beautiful voices. Did La Rondine NEED to be reimagined? 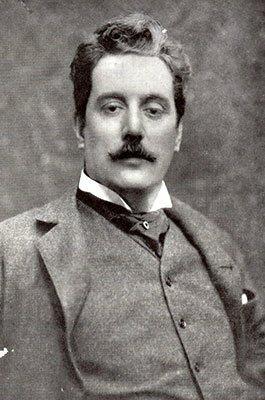 Well, Puccini DID write at least three conclusions to the opera* and was apparently never completely satisfied with any of them, so I think that some exploration on the part of those who produce it can be condoned. I’ve always loved this underrated opera; the music is prime Puccini and I think that Prunier, a kind of Noel Coward/Ivor Novello figure, is Puccini’s most interesting and original character.